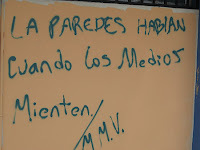 ..:recycled minds:..: "The Walls Talk When the Media Lies"
Hondurans critical of the coup regime are taking their censored messages to the streets after several constitutional rights were suspended -- including the right to free thought, the right to free movement, freedom of the press and many more. Writers Kara Newhouse and Laura Taylor have posted pictures of the graffiti that is popping up around Honduras, bold statements that give voice to a silenced dialogue. As Newhouse and Taylor explain, "...the literal writing on the walls deny the state of calm that the coup leaders claim exists and expose the state of exception that they impose. These photos capture the ongoing conversations in a shrinking space for expression." You can read their entire piece on Upside Down World.